When Visiting Maui, Stand-Up Paddle Board Lessons Are a Must! Blog When in Maui, Stand-Up Paddle Boarding Is a Must! When in Maui, Stand-Up Paddle Boarding Is a Must! When on vacation in Maui, Hawaii, there’s never lack for things to do. But if you’re an ocean sports or surfing enthusiast, or just want to experience being on a board and some waves, then the top of your Hawaiian vacation bucket list should be to SUP. What’s SUP? Not a hipster greeting. No, it’s Maui stand-up paddle boarding (SUP), which is the fastest growing and hottest ocean sport. And our stand-up paddle boarding school in Maui offers the best, most fun and exciting lessons on the island of Maui. Our instructors are world-renowned for their experience and dedication to teaching the no-impact sport. It’s a surfing sport so fun and easy — easier than surfing — that we guarantee anyone can do it. No experience is necessary. Regular surfing can be intimidating as you need to catch a wave and balance on the narrow board while manipulating the rolling wave. But with stand-up paddle boarding, the board is longer, wider, with decks with padding, concave hulls, extra fins for stability, and of course, a paddle to help propel you forward, and the paddle acts as a perfect counter-balance. And no need to wax, either. You can head for the waves, but the ideal conditions are calm flat waters. Our instructors see most beginners manipulating the stand-up paddle board in about 30 minutes. The average lesson is around an hour and a half and includes instruction on techniques, key stretching exercises and the balancing, posturing and beach and water techniques necessary to get the board from the beach to the ocean with you on it and to paddle. You will be taught theory, how to self-launch, self-rescue and of course, safety, safety, safety. Anyone ages seven and up who knows how to swim can learn. 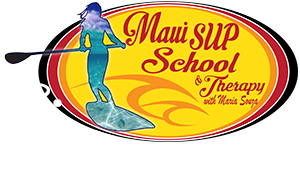 The Maui SUP school offers private lessons, group lessons and even advanced training for those who would like to learn paddle board racing. The are several areas of South Maui that the school offers lessons, a tourist who would like paddle boarding in Kihei, or paddle boarding in Maui, Lahaina. You can contact us on the website and let us know where you’ll be in Maui, and we can arrange the best places for you to enjoy Maui stand-up paddle board lessons. Why Not Try Maui Stand-Up Paddle Board Yoga for an Exciting Twist? Our Maui-based stand-up paddle board school also offers stand-up paddle board yoga, a unique aspect of the fast-growing ocean sport. Maui stand-up paddle board yoga is an awesome twist on the zen exercise routine, where you can turn your paddle board into a yoga mat. We have certified yoga instructors who are also expert SUP instructors as well. It’s ideal for a tourist activity where you can get an enjoyable workout, enjoy the wonderment of paddle boarding on the ocean, and achieve a blissful emotional state of being. All of our lessons include photos and videos taken from your experience. Our SUP surf school has a staff of ocean sports experts, certified in the sport — like stand-up paddle boarding — as well as certified lifeguards. We guarantee that anyone can learn this new and exciting ocean sports experience. We will assess your physical and swimming abilities and tailor a lesson plan for you. We offer Maui stand-up paddle board lessons, stand-up paddle board yoga lessons, ocean retreats and personal training. Have any questions? No problem, feel free to contact us at any time, and we’ll be glad to answer them.